We started with some pencil and paper sketches, set some design goals and created a concept, and this is what came out of the grape-press-o’-design. I’m using the grape press metaphor for a reason. Designs are not finished when users get their hands on them; they are really just starting to mature. In other words, this design is grape juice, and by shipping it we’ve really started to add the various fermenting agents necessary to turn it into a fine wine. To be clear, we’ve been using the thing all week. We’ve solicited feedback from Sal and others throughout the process, but there is really no substitute for real-world use. 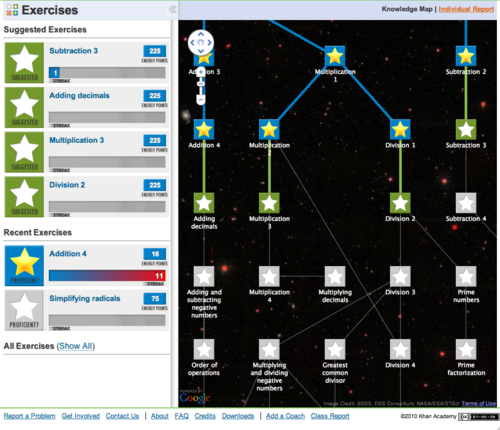 Make the knowledge map a primary means of navigating and understanding the exercises. Better integration with the layout of the rest of the site (will be addressed by major site redesign effort, more on that soon). To validate this design direction, or invalidate it for that matter, we are about to embark on an intensive pilot with a school system in the Bay Area. My plan is to document that process and learning here, in the open, so stay tuned. In the meantime, I welcome comments and constructive criticism, especially from frequent users. The most helpful comments are very specific (e.g. I was trying to this and it was hard because… or I really like the way this thing works because it made me feel…). For the moment, it’s out there and aging on it’s own. Your feedback, and the feedback from the pilot, will help expedite that process.